The Period End Column is an important tool for Financial Year Reporting; it can be switched off if you choose to do Cash Reporting for your business. When using Financial Year Reporting, transactions are allocated against the date the sale or service occurred - not when payment was made or received. This can have a significant impact on reporting when these transactions bridge the financial year. David is a sheep farmer and sells three hundred 2nd Shear Ewes on 30th June 2015 for $18,000 but doesn’t receive payment until 20th July 2015. The sale occurred in his previous financial year but payment was received in his new financial year. Simon is a wheat farmer and invests heavily in upgrading his irrigation system late in the financial year. Deferred payments mean that he receives a bill on 20 July 2015 for $7,700 although the equipment was purchased in his previous financial year. Lisa is a dairy farmer and sells 6,734.8 kg/MS on 30th May 2015 for $29,721.66 but doesn’t receive payment until 19th June 2016. The sale occurred in her previous financial year but payment was received in her new financial year. If these transactions are allocated as an expense or income against the new financial year, it can make the farm appear to be doing much worse or better than it is. For your new financial year, they will appear on the Cashflow for your Actual Transactions under Last Year (income, purchases, farm expenditure etc.). For your previous financial year, they will appear on the Cashflow for your Actual Transactions in the Period End column. This increased visibility provides a clearer understanding of your farm’s available finances and can assist with budgeting; for instance by providing an idea of future income and when an overdraft may be required. David purchases $250,000 worth of trading stock at the end of the financial year; he may appear cash poor but he is actually asset rich because there is potential income to come later on from this stock when they’re ready to be sold. Similarly, David could sell $250,000 worth of trading stock and appear cash rich but have no income to look forward to. By having the Period End column turned on, David has visibility of this transaction in both financial years and incorporates this into his budgeting expectations. Having the Period End column turned off will change your Cashflow screen to be driven by transaction (cash) reporting; it will remove the Last Year section of your Cashflow and the Period End column. All transactions will be displayed against the year in which they are paid (or income is received) regardless of when the actual sale took place. It can be difficult to identify significant transactions that impact the new financial year when the Period End column is turned off. It will be necessary to look at management reports such as Profit & Loss or Performance (EFS) reports. Tip: Management reports will differ from the Cashflow screen when the Period End column is turned off. This is because Period End transactions are still incorporated into these reports. Follow these steps to turn the Period End column on or off. 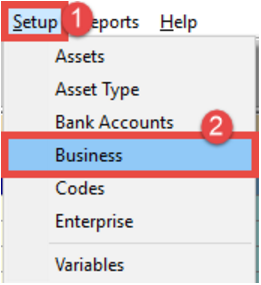 From the Cashflow screen, click on Setup and select Business. 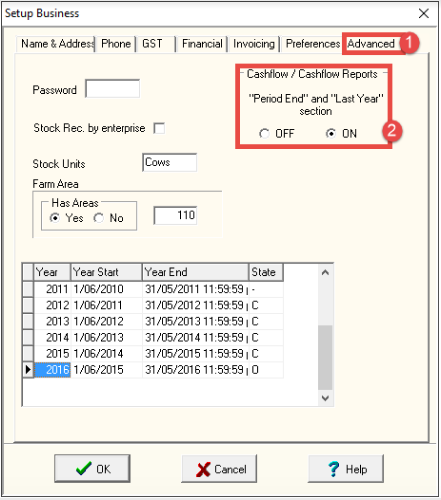 Select “Period End” and “Last Year” section on or off in Cashflow. Lisa is a dairy farmer and sells eighteen Rising 1yr Heifers on 30th May 2015 for $18,000 (GST incl). She receives payment on 20th June 2015 and enters it on the Transaction screen. In her current financial year, 2015/16, it appears under Last Year: Income in the June 2015 column (the month payment was received). In her previous financial year, 2014/15, it appears under Income: Dairy (Sales) in the Period End column (to recognise that payment was received in the following financial year). In her current financial year, 2015/16, the sale appears under Income:Dairy Sales in the June 2015 column and is included as income for the current financial year. In her previous financial year, 2014/15, the sale does not appear at all and there is no Period End column displayed. The Period End column and Last Year section can also be turned on and off for both Budgets and Transactions (Actual). When budgeting Livestock and Cropping transactions, and the Period End column is turned on, you can choose to adjust projected sale/bill dates in order to select which budget the transaction will appear in. Lisa is adjusting her Main 2016 budget in her Livestock worksheet and anticipates selling twenty-two R1yr Heifers at the end of May 2016. She creates a new sale and can make choices in her budget about both the (1) Sale Date and (2) Payment Delay. Set the sale date as 31/05/16 and the payment delay as 0 days so that the income is allocated to her Main 2016 budget. Set the sale date as 31/05/16 and the payment delay as 20 days so that the income is allocated to her Main 2016 budget in the Period End column and also appears in her Main 2017 budget under Last Year’s income. Set the sale date as 01/06/16 and the payment delay as 0 days so that the income is allocated to her Main 2017 budget. Visit our online forums to chat with other users. Our Support Centre is there to help you. Budgeting made easy - Guide.